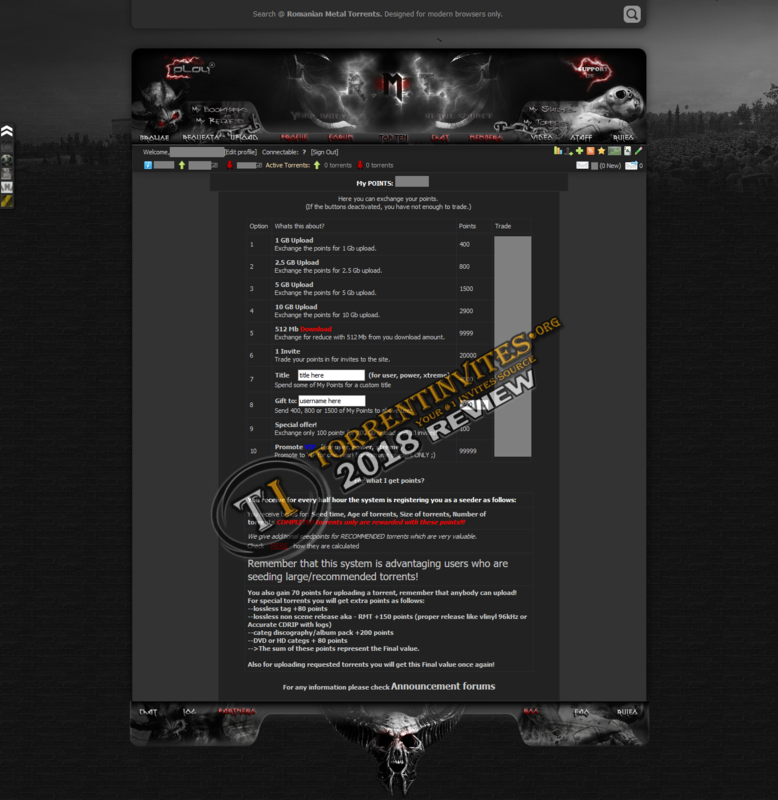 Metal.iplay, AKA Romanian Metal Torrents, is romanian tracker that specializes in rock and metal music. Created on february 2006, it is one of the oldest trackers out there. Currently it has 6050 members out of 7000 members maximum allowed. Applications are open until they reach their member cap. Of course, you can also be invited by someone inside. Upon joining, you are granted 10gb of upload credit, to help you build buffer. Maintaining ratio is pretty easy. There is decent amount of freeleech torrents. Most of the freeleech torrents are band discographies, which is really nice. They also have pretty generous bonus system. Also, there are periods (Easter, New year etc.) when global freeleech is enabled, and it lasts for weeks sometimes. At the time of writing this review, this tracker has just over 13 000 torrents, which is not that big number for tracker that is over 11 years old. This is the first problem. You would expect this tracker to have pretty much everything rock & metal, but you would be wrong. Of course, this tracker has almost all lossless discographies of the more popular bands in specific sub-genre of metal (death metal, black metal, power, grindcore, etc.) however, if you're looking for some not well-known bands (underground bands) chances are that you're not going to find their stuff here. There is also one thing that somebody might find annoying and it is that vast majority of discographies and albums are uploaded as one big file, so you have to split those big files with .cue splitters if you want to have songs separately. Good thing is that most of torrents are seeded by enthusiasths that are keeping them alive for years. There is always reseed button, in case there are no seeders. They have friendly community & staff, but unfortunately their forums are not very active (sometimes a couple of days pass without single post). Same goes for IRC which is also not very active. That being said, if you are member of trackers like redacted or apollo, apart from friendly metalhead community (not very active though), you won't find much here. If you're looking for some underground metal stuff that is not on redacted, apollo or similar, I suggest that you first check rutracker and metal-tracker, which are both open for signups. My feeling is that this tracker is very old and not progressing forwards, and that there have not been a lot of dedicated uploaders to create big torrent pool, which would make this tracker more active. I really hope that I'm wrong. In the end, i would recommend this tracker to metalheads that are new to tracker world, and are looking to download discographies of their favorite bands. Try entering via applications, if you know what you're talking about, they will surely let you in. Don't get me wrong, it is nice, well-seeded tracker (not great speeds on older torrents, though) but it doesn't offer more than big music trackers I mentioned above. jimmy7, eStark, Evergarden and 7 others like this. Great review, thanks for this.